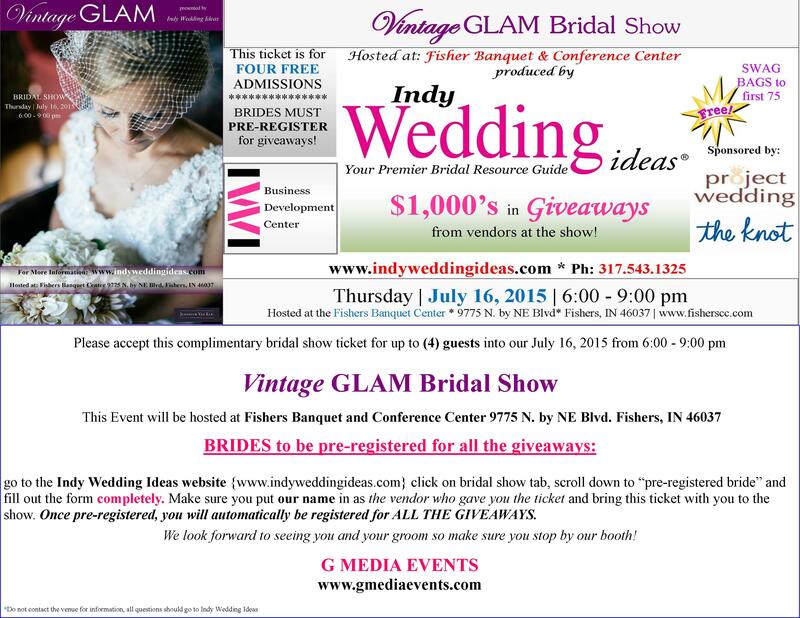 FREE TICKETS AND WIN PRIZES AT The Perfect wedding guide BRIDAL SHOW IN august! We will be at the Crowne Plaza Union Station (123 West Louisiana Street, Indianapolis, IN 46225) on Sunday, August 9, 2015, from 12-4pm. 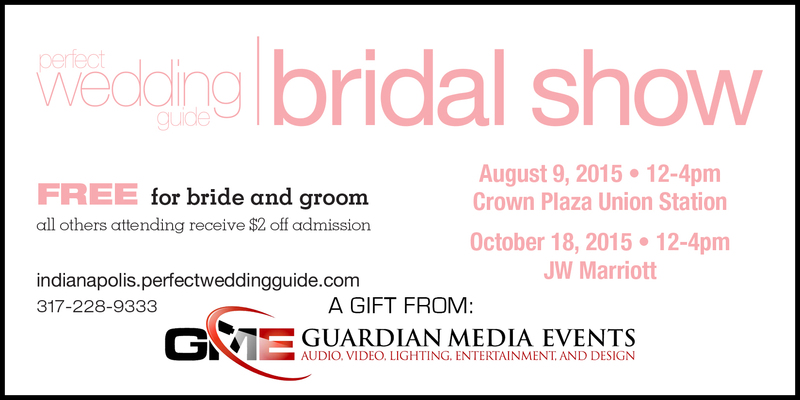 gMedia itself will have at least 5 prizes and great discounts that we ONLY offer our bridal show attendees. That's right. 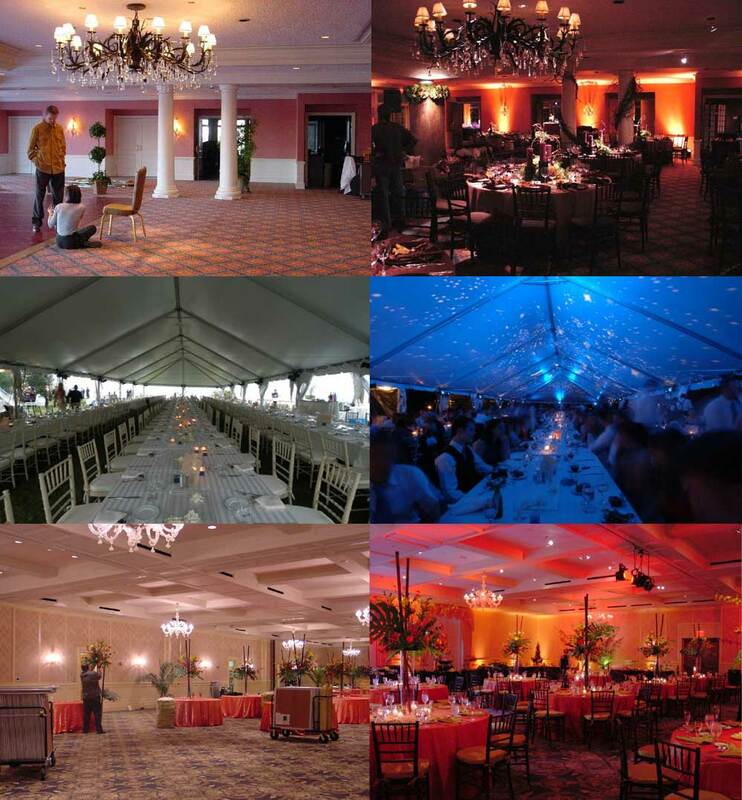 Every single couple who comes to a PWG Wedding Show will receive $1,000 to spend on their wedding at the show! How do they work? When arriving at the PWG Wedding Show we will give you vouchers to spend on participating vendors at the show. It's as simple as that. 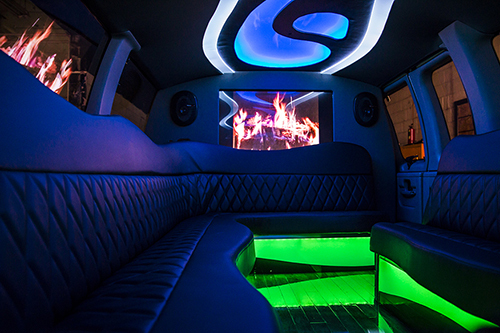 Add some cushion to your wedding budget, or splurge on something special just because. How you use your savings is up to you. • Live NY style fashion runway show featuring the latest style and trends for brides, bridesmaids & groomsmen. • Grand prizes are worth $500+ and can include beautiful wedding bands, all inclusive honeymoon packages and more! If you know of any engaged couples this is a perfect opportunity for them to win some cool prizes and get some great ideas for their wedding. Just print our ticket out and the bride and groom get in free! Also, you get $2 off any other tickets for friends and family. Must present ticket at the door. Hope to see you all there and if you have any questions about the show, please contact us! I was looking for something fun to do in Indy for my husband and I for valentine’s Day, I came across quite a few things that are going on this weekend and thought I would share what I found. Hope this helps all the procrastinators this weekend. Be My Valentine 5KCost: $30/person When: Valentine’s Day @ 9am Where: 801 West Washington Street The Be My Valentine 5Krun/walk course goes through White River State Park, past the zoo and through IUPUI. The race benefits Riley Hospital for Children. Date Night Yoga and MassageCost: $17 BOGO admission free for Friday Night (5:45-7pm) Date Night Yoga and $25/person per workshop on Saturday,$40/person if you do both workshops. Saturday –Essential oil class from 10:00-11A and from 12-2p enjoy partner yoga and massages at All People Yoga Center. Candlelight Partner YogaJoin a 90-minute class at CITYOGA to create poses and sequences with your partner, complete with an exploration of Thai massage techniques. 5:30 to 7:30 p.m. Feb. 14, 2442 N. Central Ave., $25 per couple, register in advance, (317) 920-9642, cityoga.biz. Glass BlowingKenyon's Creations is offering two Valentine's Day classes at GRT Hot Glass Studios. Create a heart or sphere paperweight with your loved one. Stay after for a free demonstration in glass blowing. 3 p.m. and 6 p.m. Feb. 14, 6400 Brookville Road, $45 per person, (317) 979-6941. Love, Lust and ArtThe Love, Lust, and Poetry exhibit is running all month at Nickel Plate Arts, but there are a variety of activities throughout Valentine's weekend. 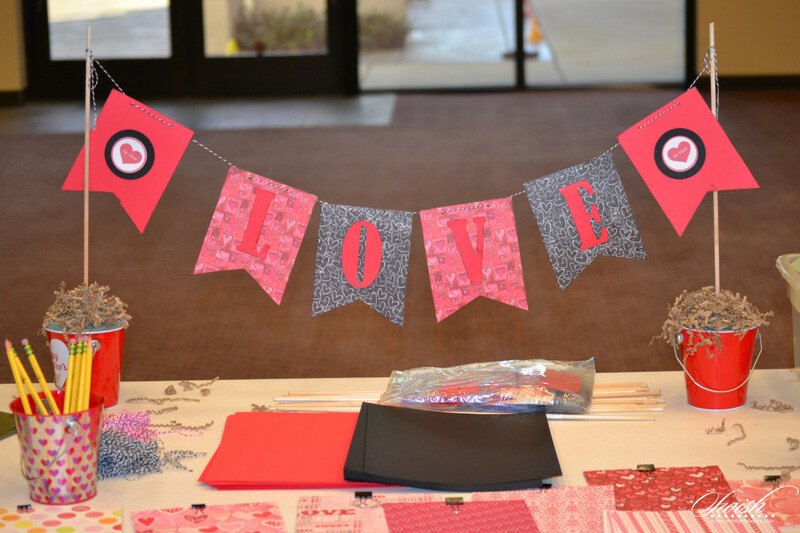 From 6 to 9 p.m. Feb. 13, a singles' mixer offers art projects, snacks and drinks for $40. A family open house will be held on Valentine's Day with activities ranging in price from free to $5. From 6 to 9 p.m. that evening is date night for couples, featuring spoken word presentations and art stations ranging from ukelele lessons to cupcake decorating. Each activity is $10 per couple. Feb. 13 and Feb. 14, 107 S. 8th St., Noblesville, (317) 452-3690, nickelplatearts.org. Sweets for your sweetieThis event pairs treats from the tropics like chocolate and coffee to highlight Garfield Gardens Conservatory's tropical plants. Enjoy them by candlelight and learn more about their origins.7 to 9 p.m. Feb. 14, 2505 Conservatory Drive, $8 per person, $15 per couple, reserve by Feb. 13 by calling (317) 327-7580. Valentine's Day Sweetheart DinnerThe Indianapolis Propylaeum hosts a romantic candlelight dinner for two with music provided by harpist Elizabeth O'Meara Ahlgrim. 6:30 to 8:30 p.m. Feb. 14, 1410 N. Delaware St., $100-$150 per couple, (317) 638-7881, propindy.org. Valentine's Day Dinner at Sullivan's Steakhouse"Sweep her off her seat" at Sullivan's Steakhouse for a three-course dinner. Feb. 13 to 15, 3316 E. 86th St., $59 per person, (317) 580-1280,sullivanssteakhouse.com. Dinner at The Melting PotThe Melting Pot of Indianapolis refers to chocolate and Valentine's Day as "The Original Power Couple." A special five-course prix fix fondue menu will be available.Feb. 12 to 15, 5650 E. 8th St., $65-$80 per person, (317) 841-3601, meltingpot.com. Valentine Dinner at Prairie Guest HouseMake room for a four-course candlelit dinner at Prairie Guest House. To make a full night of it, reserve a guest room that will be prepped with a few special touches. 6:30 p.m. Feb. 13 and 14, 13805 Allisonville Road, Fishers, $120 per couple, $250 per couple for dinner, a guest room and breakfast the following morning, (317) 663-8728,prairieguesthouse.com. Sweet beatsSee funk and R&B musician Bootsy Collins along with Donnell Jones and Miki Howard perform during the Love, Funk and Flow Valentine Festival at the Murat Theatre at Old National Centre. 8 p.m. Feb. 13, 502 N. New Jersey St., (317) 231-0000, $62.49,oldnationalcentre.com. A Musical Valentine: Through the Eyes of Love Indiana University's The Singing Hoosiers pay tribute to Marvin Hamlisch with music from titles like "A Chorus Line," "Sophie's Choice" and "The Way We Were" at the Palladium.7:30 p.m. Feb. 14, 1 Center Green, Carmel, $10-$63, (317) 843-3800,thecenterpresents.org. Love is All You Need Dinner DanceThe Rathskeller will host a three-course meal followed by a live performance at 8 p.m. by Woomblies Rock Orchestra at this annual event.6 p.m. to midnight Feb. 14, 401 E. Michigan St., $90 per couple, call (317) 636-0396 for reservations, rathskeller.com. Be My ValentineAfter a romantic dinner, head to The Warehouse in Carmel for "Be My Valentine" — an evening of champagne, chocolate-dipped strawberries, petit fours and live duets by Blair Clark and Heather Ramsey Clark.8:30 to 10:30 p.m. Feb. 14, 254 1st Ave. SW, Carmel, $45 per person, (317) 661-1760, visit liveforthemusic.com for reservations (required). "Spank! The Fifty Shades Parody"It's been dubbed the world's No. 1 theatrical musical parody. Inspired by the steamy read that women went wild for, see "Spank! The Fifty Shades Parody" at Old National Centre.8 p.m. Feb. 13, 2 p.m. and 8 p.m. Feb. 14, $27.50-$47.50, 502 N. New Jersey St., (317) 231-0000, oldnationalcentre.com. "My Fair Lady"Can a snobby professor take a regular girl and make her into a woman of high society? Take your main squeeze to see the 1964 film, "My Fair Lady" starring Audrey Hepburn at the Historic Artcraft Theatre. 2 p.m. and 7:30 p.m. Feb. 13. and Feb. 14, 57 N. Main St., Franklin, $3-$5, (317) 736-6823, historicartcrafttheatre.org. "Casablanca": Film and Live OrchestraWatch one of the greatest love films of all time while the Indianapolis Symphony Orchestra performs the film's score at several showings Feb. 13 through Feb. 15. 11 a.m. and 8 p.m. Feb. 13, 8 p.m. Feb. 14 and 3 p.m. Feb. 15, 32 E. Washington St., $15-$91, (317) 639-4300, indianapolissymphony.org. "An Affair to Remember"Cozy up in the Toby at the Indianapolis Museum of Artfor the 1957 romance film starring Cary Grant and Deborah Kerr. Before the film, get in the mood with a love letter writing workshop. 8 p.m. Feb 13., 4000 Michigan Road, $6 members, $9 public, (317) 923-1331, imamuseum.org. Sweet 16 at Nicky Blaine'sCelebrate Nicky Blaine's 16th anniversary on Valentine's night with drink specials, live music by Saints of Havana, and prizes. Share your Nicky Blaine's-related love story on social media in advance to enter. 6 p.m. doors, 8 p.m. music, Feb. 14, 20 N. Meridian St., $5 cover, (317) 638-5588,nickyblaines.com. "An Affair to Remember"Cozy up in the Toby at the Indianapolis Museum of Artfor the 1957 romance film starring Cary Grant and Deborah Kerr. Before the film, get in the mood with a love letter writing workshop.8 p.m. Feb 13., 4000 Michigan Road, $6 members, $9 public, (317) 923-1331, imamuseum.org. Make sweet treats for your loved one. Cookies and cupcakes are the way to anyone’s heart right? If you want to get real creative print out some cupcake flags. You can also write something you love about your date either on the back of the flag or write a short but sweet note they have to read as they eat each cupcake. Make Dinner. 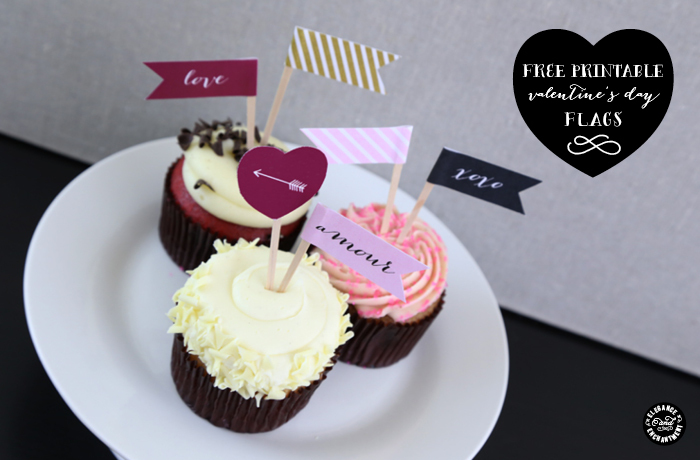 Find a cute printable banner. When your Valentine comes home from work have the house cleaned, dishes done, decorate, and write a heartfelt valentine. You could also rent a movie that they have been wanting to see and make some popcorn.